At Crossfit this morning we got hit with the benchmark workout known as “Helen,” which consists of three rounds, for time, of a 400 meter run, 21 kettlebell swings with a 24-kilo kettlebell, and 12 pullups. Normally Crossfit workouts aren’t repeated, but Helen is one of the benchmark workouts that gets trotted out periodically so that we can measure our progress. The last time we did Helen was in February. I don’t remember my time, but I know I had to scale down weight on the kettlebell swings and use a giant rubber band to get through the pullups. The run, of course, was the easy part. Today my goal was to get through Helen as prescribed (or “RX” in Crossfit lingo) — and I did it! With a time of 14:48, I was not the fastest in the class (though not the slowest, either), and I made it through all three rounds with the full 24-kilo kettlebell and the pullups without any assistance. 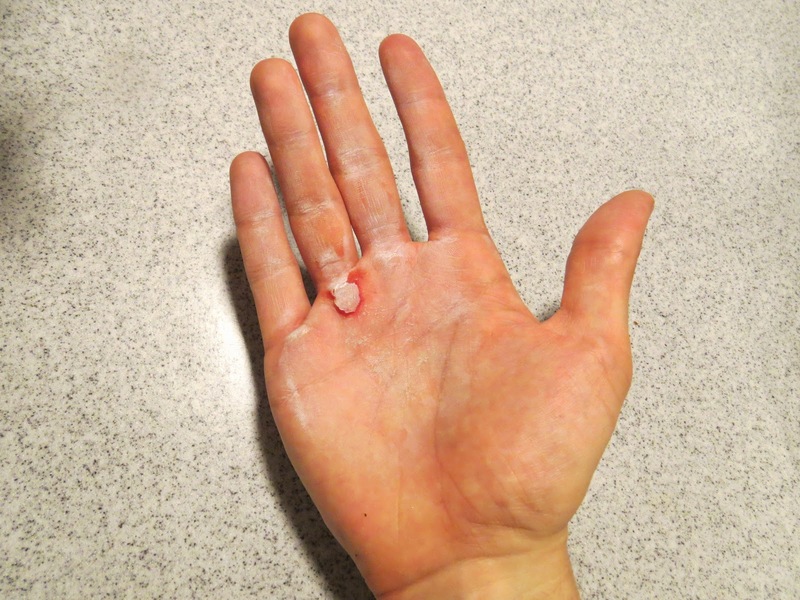 As I suffered through the last round of pullups I totally wanted to die (and feared I might puke), but everyone who had already finished stood around cheering me on — which was really great and one of the reasons I love Crossfit.
. . . all those pullups kind of destroyed my hands. Both hands look like this. it’s just hanging on by a bit of flesh at the top of the flap. Obviously showering, etc., was way more difficult and painful than normal. 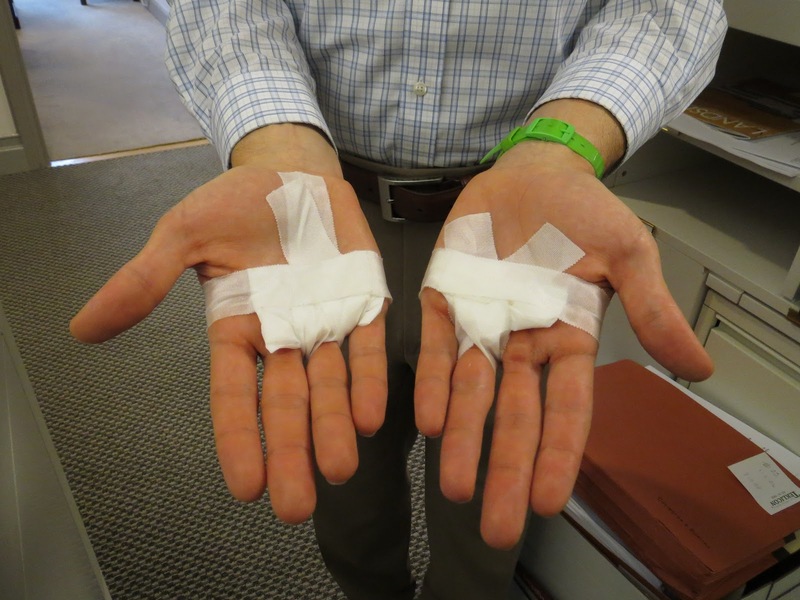 Fortunately, I still have plenty of gauze and tape and disinfectant/anesthetic cream from my last hand fiasco, so once I’d cleaned myself up I just bandaged everything and went to work looking like I’d been attacked by a drunken Florence Nightingale. Needless to say, I think it’s time to find some of those straps that I’ve seen other guys wear to protect their hands. Add that to this weekend’s shopping list! ← The grills are out at Heidelberg Bakery!